This toilet paper holder is a modern replacement for the traditional one, toilet paper won't fall off. Sturdy SUS304 stainless steel construction ensures durability and longevity, resist daily rust and tarnish. Clean lines with beautiful polished chrome finish add a modern touch, nicely matches your bathroom fixtures. Functional tissue roll holder with elegant design, includes mounting hardware for easy installation, easy to use. 【 STYLISH AND FUNCTIONAL ALTERNATIVE 】 our elegant toilet tissue holder is a great replacement for those traditional types, no more spring-loaded insert to deal with. 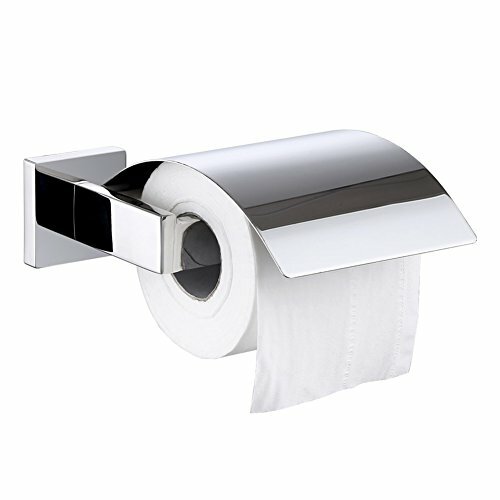 【 EASE OF CHANGING TOILET PAPER 】 open arm design makes it easy to add or remove toilet paper, the lip at the end of the bar keeps paper from sliding off. 【 PREMIUM MATERIAL AND SOLID CONSTRUCTION 】 solidly made of premium SUS304 stainless steel with glossy polished finish for durability, resists rust, corrosion and tarnishing. 【 USER-FRIENDLY DESIGN 】 the front cover helps keep the toilet tissue from water splashing if mounted near the sink, it also keeps the dust off the toilet paper. 【 EASY INSTALLATION & SECURE ATTACHMENT 】 mounting hardware included for easy installation, secure attached to the wall without wobble if anchor it properly.